Descubra la historia búlgara, la cocina y la elaboración de vinos en una excursión de un día completo desde Sofía a Plovdiv y el Valle de Thracia. 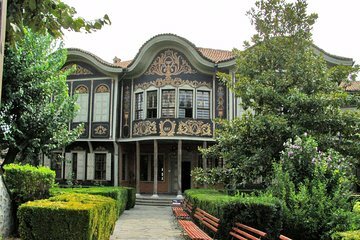 Pase la mañana paseando por el casco antiguo de Plovdiv, declarado Patrimonio de la Humanidad por la UNESCO, haga una pausa para disfrutar de un tradicional almuerzo búlgaro, luego visite un viñedo para una degustación guiada y una visita guiada. Este tour de 10 horas incluye entradas al Teatro Romano de Plovdiv, almuerzo y degustaciones, con recogida y devolución en los hoteles de Sofía. Latschezar Raymond Gudev of Group P Tours was excellent. He is well informed, well read and knows the history of Plovdiv, Thracia Valley, and Bulgaria. He is a natural teacher and I was a willing student. Awe inspiring views even with all the snow. We stopped for lunch at a local restaurant and had the best tasting hearty soup I've had in a long time. The wine tasting was a surprise to me. I didn't know Bulgaria produced such fine wines. Thoroughly enjoyed myself and have already referred people. Definitely worth the time and price. I loved this tour and would highly encourage taking this particular tour if you have an extra day in Sofia. I had a private guide who was spectacular. I would go back to Plovdiv on another day to do some shopping as there were many shops that had unique gifts. We joined in a tour of Plovdiv and wine tasting. It was very good because there were only us that joined in the tour on that day. The guide was kind and had a lot of knowledge and tried to make us satisfed with our tour. We enjoyed wine tasting a lot. We bought a red wine which we tasted and a sparkling wine that we didn't taste. The both of them were very good. The tour and wine tasting was great, it would have been so much more fun if it hadn't rained the whole time!! Our guide,Nely, was very knowledgeable and helpful. Always asking what the group would like to spend more time on ...and a needs. I really enjoyed the wine tasting. The winery is very beautiful and the wines amazing. Would recommend this tour to anyone. Thoroughly enjoyable tour and really well worth it. Visited Sofia for a long weekend and this made the holiday for us. Would definitely recommend.